Songs to Remind You That You are Beautiful! Here are few songs that may put some of your emotions into words. Hope it is a nice reminder that you are beautiful just the way you are. Do you speak more negatively to yourself than you do to others? What are some negative statements that you could turn to positive ones? This is a touching song from Natalie Grant, “The Real Me.” The video includes the lyrics. We hope it is comforting to you. She wrote this after recovering from bulimia. This pop tune may sound familiar but the lyrics may have passed over you. Christina sings of how you can feel beautiful and then someone says something about your looks, and boom–you are crushed. This song is a reminder to not let the words (or looks) of others get you down. For those of us with chronic illness this is a nice reminder, as we can feel good about ourselves and the the “look” or raised eyebrows of one person can hurt so badly. Many of us women grew up with high expectations when it came to our looks. Maybe you spent an hour curling your hair or getting mascara on every single lash. When you have strived to be beautiful at all time– and suddenly you lose control because of an illness, it can be devastating. Perhaps even if you are hitting middle age, you still despite how your body looks because of your illness and are still struggling with expectations you placed on yourself many years ago. I think you will like the lyrics. Who knew there were so many songs about being beautiful–on the inside!? In this one, Plumb sings about how a husband feels when he sees his wife–in the morning without the makeup, when she is running late, when life gets busy with work and you are passing each other in the living room. Still, he looks at her and says she is beautiful. And Plumb knows. . . as a Christian artist she has lived many years with anxiety and physical conditions–as well as a 6-month separation from her husband. Some of are carrying around the baggage of not feeling like we measured up to someone we once loved. It could be a high school crush or an ex-spouse. Kelli reminds us all at we are beautiful and we need to let these men–and their lack of appreciation for us–go. The lyrics of I am Beautiful are lovely, as if a woman is dating someone who doesn’t appreciate her and yet she knows that God says she is beautiful and deserves so much more. This song is for tired and worn out moms who have not necessarily “let themselves go” –they are just too exhausted to care. If you are a chronically ill mom, you will be able to relate with this video. The song reminds us of what is really important–and it’s not our beauty regime. Sometimes we use our clothes and makeup and fixed up hair as a way to prevent people from wondering what is wrong with us. When we look pretty good, people don’t ask about our illness and then give their advice. We use it as a shield. 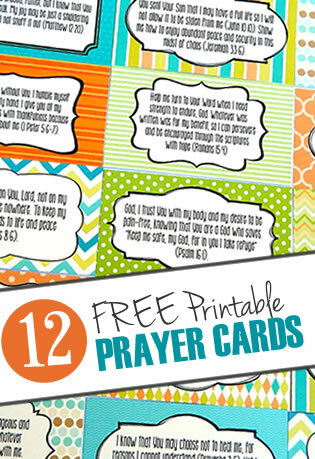 Mandisa wonders, however, what if we were real and shared how we really felt? What if we decided not to keep it all inside and hidden? I hope you bookmark this page and share it and come back at your convenience to listen to a song that is exactly what you need to hear. Proverbs 20:29 says, “The glory of young men is their strength, gray hair the splendor of the old.” And Proverbs 3:15 says, “She is more precious than rubies.” You are beautiful in God’s eyes because He sees your heart–and your heartache; your passions– and your pain. When He sees you all He can think of is how much He wants you to be His and be with you eternally. Can you help us spread the word about our article series? Each article has those little “share” buttons at the top and all you have to do is click them to share. So “like” it, share on Facebook, pin it on Pinterest and help us encourage the many men and women who are feeling rather frustrated about their appearance. Let us remind them they are precious in His sight — and so are you! 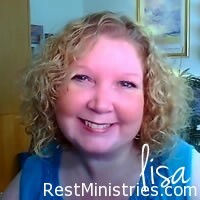 Lisa Copen is the founder of Rest Ministries and she lives in San Diego with her husband and son. She thinks she is qualified to write about body image because she struggles with it herself! She is constantly trying to find the balance between desiring to look good (and be as healthy as possible) and knowing God loves her just the way she is. She has had a constant battle with her weight due to prednisone and pain of rheumatoid arthritis that makes even walking difficult and she thinks God should increase the calories burnt from fighting chronic pain. You can see the books she has written, including, Why Can’t I Make People Understand? at the Rest Ministries shop. Filed Under: Articles, Hurt Feelings, Loneliness, Self -Esteem, Self-Esteem & Body Image Series, Videos, What's New? 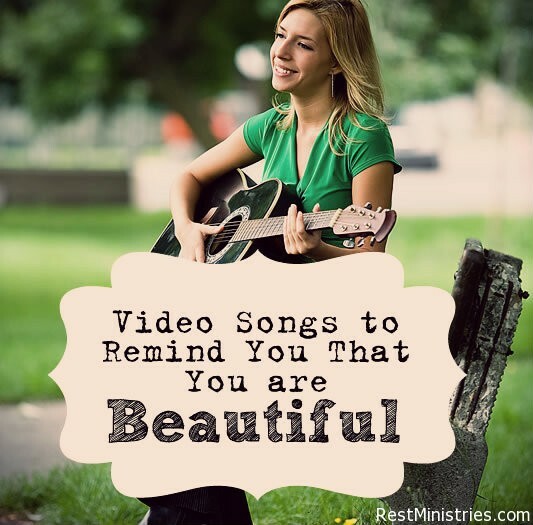 3 Responses to Songs to Remind You That You are Beautiful! Thank you! This one is definitely a keeper!! How wonderful to have this music library..Thank, Lisa. How wonderful to have this video library..Thank you, Lisa.